US President Donald Trump makes a statement about immigration. 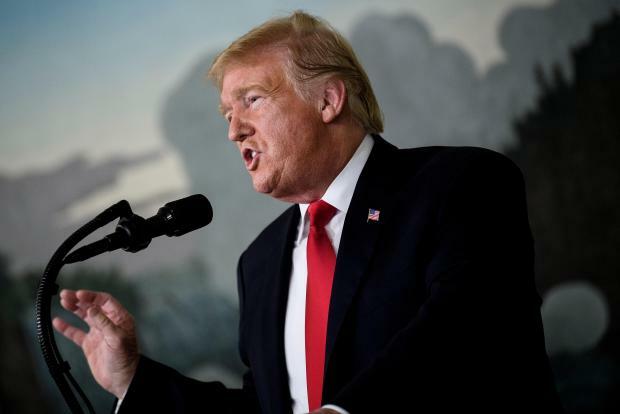 President Donald Trump on Saturday offered temporary protection for people illegally brought to the US as children and other groups of immigrants facing deportation, in exchange for funding for his controversial border wall. But Trump's proposal to end the 29-day partial shutdown of the US government, which was sparked by a dispute over funding for the wall, appeared dead on arrival, with the top Democrat in Congress rejecting the proposal based on reports of its contents prior to the speech. One of his "compromises" was on so-called Dreamers - who entered the US illegally when young. He still wants $5.7bn to fund the wall. Speaking from the White House, Mr Trump offered two compromises to break what he called the "logjam" over the shutdown. He also said he would extend for three years the visas for Temporary Protection Status holders.